Take advantage of our deals and seasonal offers below. Don't miss a chance to save, get free maps and travel guides, or attend the summer's hottest party! Bigger kids and students ages 12 up to 28 at time of travel can get up to 35% off the adult price by purchasing a 2nd-class Eurail Pass. For 1st-class passes, the youth discount is approximately 20% if available. 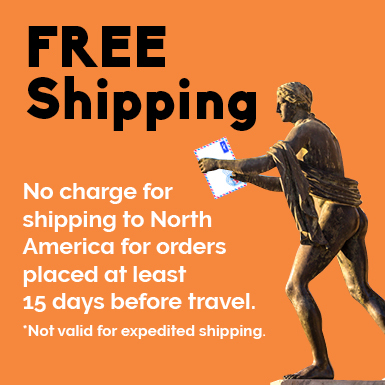 FREE standard ground shipping is available to all addresses in the US and Canada for Eurail Pass orders placed at least 15 days before departure. International, Priority and Overnight shipping options are available for an extra cost. A FREE Travel Pack is provided with each Eurail purchase and includes: Travel Wallet, Full European Rail Map, Pass Travel Guide and a free Souvenir after your travels (upon completion of the Eurail survey). 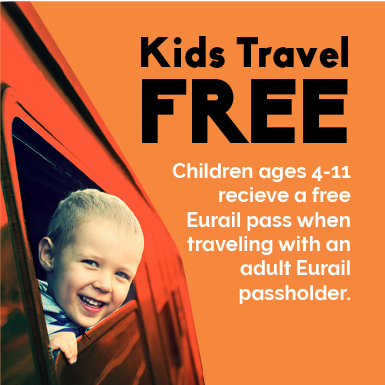 Children up through age 11 can get a free Eurail pass when traveling with an adult Eurail passholder. Up to 2 children can travel free for each adult passholder (ex: 2 paid adults will allow up to 4 children to travel at no cost). Choose at least 1 adult with the child when ordering. If there are more than 2 children per adult, we recommend getting a Youth Pass.